Discussion in 'Politics, Religion, Social Issues' started by ugahairydawgs, Oct 9, 2012. Would love to hear the President's explanation on all of this. Republicans grouped that bill with an Iraq spending bill, which Obama promised to vote against until there was a time table for withdrawal. I'd love to see Thomas Sowell explain that, and what exactly this "Obama ghetto" accent is. I hope his response is in a ghetto-style accent. I guess governments are not adverse to using a 'poison pill' to prevent a hostile take-over too. This is the same rascist dredge coming from the same crowd that never could accept a black man as president. These include birthers, "he's Islamic", "he was born in Africa" crowd. Anything to delegitimize this intelligent man who happens to be of a different color. What's there to explain, that the GOP are being a bunch of whiny crybabies, again? So, if it's all about racism, how do you explain this? So is it your contention that an African-American cannot hold conservative views, and if he does, owns a cabin somewhere? Exactly. Powell, Rice, Thomas and even Bill Cosby aren't "black enough" because of their political views. Pretty much. And a gay Republican is like a Jewish Nazi. All sellouts. Black folks have their idiots too. Believe it or not, I actually knew a black skinhead. He referred to himself as a "dark skinned European". Now that's some ****ed up s***, but it happens. No- their black enough. But they should know better than to belong to a party that has discrimination written into their platform. That they don't is pathetic. Some people just never learn I suppose. His economics is of the shallow trickle-down variety, clothed in a few phrases borrowed from Libertarianism. No wonder that the practitioners of shell-game capitalism love him. I have difficulty comprehending the logic that an entire race of people should support someone based solely on the color of their skin. The notion that a black person that doesn't support Obama is somehow a sellout is the absolute epitome of EVERYTHING that is wrong in this country. 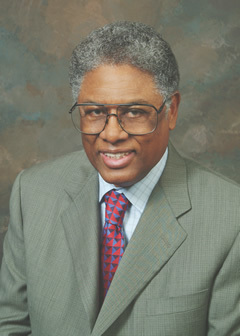 Thomas Sowell is grown dang man and it entitled to any opinion he so chooses. Same goes for any man or woman who dares step outside the umbrella of the Democratic Party. Always amazes me how the supposed party of inclusion and tolerance has such a hard time tolerating people with an opposing viewpoint. He's absolutely entitled to any opinion he wants. Who said he wasn't? But I'm entitled to mine as well. And yeah, I have a damn difficult time with any minority who would support a party with discrimination written into it's platform. That is seriously messed up and no- I won't tolerate it. They don't have to support Obama, but they certainly should not be supporting the GOP. No- their black enough. They should know better than to belong to a party that has discrimination written onto their platform. That they don't is pathetic. Some people just never learn I suppose. Right because appointing such individuals to positions such as line of succession of the presidency and the supreme court is racist. The minorities appointed by Bush don't count. I get it. The sitting VP has made his share of racist comments. Surely that must be representative of the democratic party. No, let's go with old stereotypes about all republicans being racist. The GOP has written discrimination into their platform. GO READ IT. It's quite obvious and in black and white. Would be nice to deal with facts and opinions on the subject, rather than resorting to personal comments. Action speak louder than words. I'm sure you will find plenty of outdated backwards stuff in the democratic party platform as well. As a black, what has Obama done for other black americans? What about other prominent black americans such as Sharpton and Jackson? Wait, what? Please elaborate on this. Where did you know this person from? I doubt he was accepted by other skinheads. Yes. You are entitled to your opinion. We all are. My problem is not with your opinion, but your tone. It's one thing to disagree with what he said. Base it on facts of what actually happened and make your case. That's fine and what needs to happen in order for a proper debate of the issues to take place. But your whole premise isn't about an issue. It's the fact that a black writer is not supporting the black President and that somehow makes him a sellout in the process. By the same logic we could call just about everyone at MSNBC sellouts for not supporting President Bush. In the end there's no debate of any issue going on....just name calling. It's how the political discourse in this country has gone. Don't like someone with an opposing view? No big deal....just call them a racist, or a misogynist, or someone who hates babies and old people. In general, nobody discusses issues anymore. We just look at someone who has a different opinion and label them as moron without any sort of examination of anything. It's why nobody freaking gets along anymore. If that's your aim....then that's perfectly fine. You can join a pretty big group of folks who carry on that way. Its why Fox News and MSNBC are as successful as they are. But nothing is ever going to get any better until we get past this type of division and folks stop dealing in absolutes. When did blacks go from being evenly divided on gay marriage to fully supporting it, excepting sellouts? And please stop acting as though you're a moral arbiter for black people on this forum. I suppose you also support 100% of what's in the Democratic platform? During their convention when they voted to change their platform (remember the whole adding God and Jeruselum change) you must have happily gone from supporting 100% of the platform before the change to supporting 100% of the platform after the change? Of course not! Most people aren't that aligned with a political platform. I agree with you. I think the us vs. them mentality is ruining our country - and crippling our legislature. And we are allowing it to happen by voting for these people and sending them to Washington on our behalf. That said, ironic that you are the originer poster. By posting this article (which, right or wrong, seems extremely biased) you are doing exactly what you seem to be railing against. I can't freaking wait until this election is over - then we'll stop getting these ridiculous he did/he didn't/he said/he didn't say threads. stupid little facts getting the way of an attack yet again. I have no problem with religion as long as it does not make policy. And yes, I have a major problem with any minority that supports discrimination against another minority- A MAJOR PROBLEM. That makes absolutely no sense to me. I will agree with you that using phony for his headline was a bit much. Call it disingenuous or whatever, but phony is not going to sway opinions since it will just galvanize the President's supporters before they even read it. This is what we've devolved into...and it's sad. I honestly hope one day we get past all this bickering and come together without needing something like 9/11 to make it happen. This country was a great and strong place in the aftermath of that horrible tragedy and ever since then we've gone deeper and deeper down the rabbit hole.